From candy and nut stores to fruit and vegetable markets, people get their food from a variety of places, and all of those places need reliable vendors to keep their operations humming. Make your business a valued resource for them with this grocery store email list. People who own and operate market stalls and food stores, both large and small, are hard-working individuals without which we wouldn't be able to feed our families many of the things we eat every day. If your business has a product or service that can make their lives easier, tell them with this mailing list of grocery stores, which also includes specialized professionals such as bakers, butchers, and fishmongers. When you buy and download this premium email marketing list, you'll be able to reach out to grocers, meat and fish stores, bakeries, candy shops, and others who sell foodstuffs all across the country. 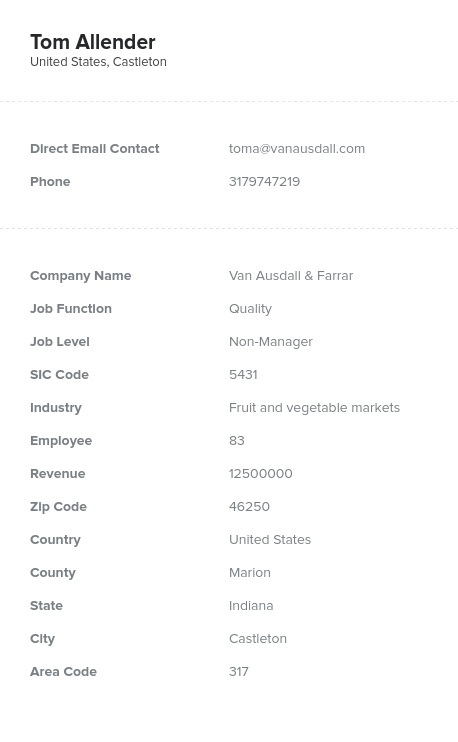 Whet their appetite for your product or service using the detailed contact information in this food store email database and you're sure to see a difference in your bottom line. Just email them, call them, send them direct mail, or even fax your marketing materials to these important sales leads, and soon, food purveyors will be hungry for what you're selling! Best of all, we check this grocer email list on a regular basis to make sure that none of the contacts have spoiled: We only sell fresh, usable, accurate information here. Buy this business database today and we're sure you'll be satisfied with the results!